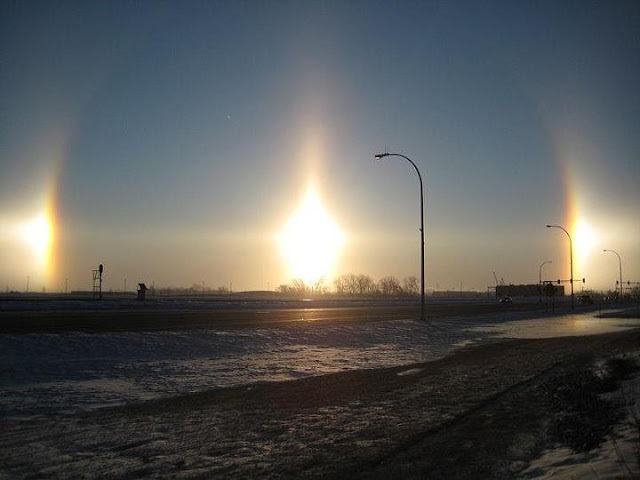 Sundogs, also known as Mock Suns or Parhelia, are a pair of brightly coloured spots on either side of the Sun. They are most easily seen when the Sun is low. Sundogs form when sunlight is refracted by ice crystals with diameters larger than 30 micrometers. They are visible when the Sun is near the horizon and on the same horizontal plane as the observer and the ice crystals. 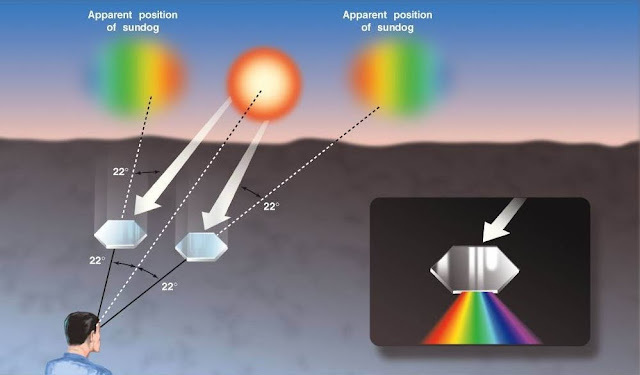 When the sunlight passes through the ice crystals, it is bent by 22° before reaching the observer’s eyes, just like what happens with 22° haloes. The bending of the light causes sundogs to form. Sundogs differ from haloes in the preferential orientation of the ice crystals. If the hexagonal ice crystals are oriented with their flat faces horizontal, then a sundog is seen. If the crystals are randomly oriented, a halo is seen.